Gone are the days where a hotel close to the beach or with its own swimming pool were the main requirements for a family holiday. Now families love to have the convenience of having everything on site. The days of queuing for ages to get into the local over crowded aqua park and long lines waiting patiently for the best slide are now in the past with the arrival of the aqua park hotel. Each new water park hotel is getting more and more sophisticated with twisting slides, fast vertical drops and lazy rivers popping up everywhere it adds to the family fun. 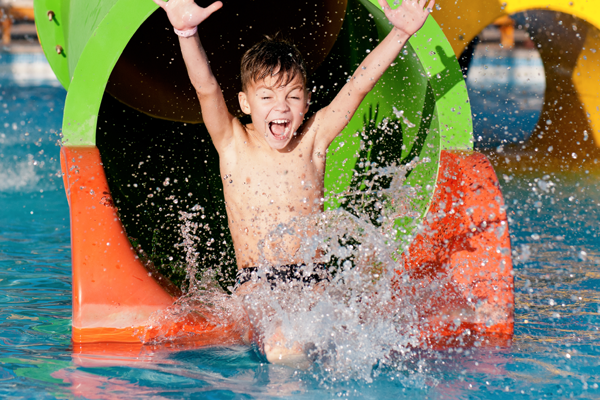 Younger kids are usually well catered for with smaller slides and shallow pools so the little ones don't miss out! Many aqua hotels are situated in popular family friendly resorts throughout the Med, the Canaries and the Red Sea. Some of these aqua park resorts offer mini theme parks with additional rides all included in the price of your holiday. We have picked a selection of our top selling hotels with water parks and listed them below. For a fantastic deal on your Aqua Park Holiday why not call us today and we will find the best deals at the right price.